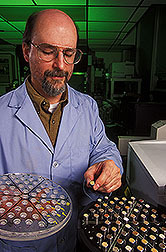 Chemist Barry Francis loads Brazilian soil samples into an autosampler for mid-infrared analysis of carbon content. Helvecio De-Polli is not an Agricultural Research Service (ARS) scientist, but a casual observer wouldn't have known that. For 2 years, he participated in a research collaboration, known as LABEX, between ARS and the Brazilian Ministry of Agriculture, Livestock, and Food Supply's Empresa Brasileira de Pesquisa Agropecuaria (Embrapa). De-Polli, of the Embrapa Agrobiology Center, was a visiting scientist in USDA's Environmental Quality Laboratory in Beltsville, Maryland, from June 2002 until May 2004. Hosted by soil scientist Gregory McCarty, he contributed ideas and efforts to several projects concerning global climate change, greenhouse gases, and carbon sequestration. According to Pedro Arraes Pereira, the third LABEX coordinator to serve at ARS, De-Polli's stint "set up a base of research to build on. Dr. De-Polli also facilitated further research on global climate change in the United States and Brazil." The LABEX program began in 1998. Brazil proposed the collaboration because the two countries face similar agricultural and environmental challenges. It made sense for Brazil and the United States—two major agricultural powers—to join forces to address those challenges. Brazilian soil scientist Helvecio De-Polli collects a gas sample for measurement of greenhouse gas emissions from a long-term soil-management plot at the Beltsville Agricultural Research Center. Agricultural activities can both affect and be affected by environmental changes, says McCarty. The goal is to use good agricultural practices to help mitigate the impact of human activities, such as fossil fuel consumption, on the environment. Using soil to store carbon is one way to accomplish that goal. "One instance of common ground between Brazil and the United States is the promotion of soil as a storage unit for carbon," says McCarty. "Soil carbon is becoming recognized as a valid commodity, with a market that allows carbon trading." Some agricultural practices promote carbon storage in soil. One such practice is no till, which means soil is, for the most part, left undisturbed after planting and harvesting. De-Polli used a field site at the Beltsville Agricultural Research Center, where a 10-year-old tillage experiment comparing no-till and plow till has been conducted. Soil microbial biomass and carbon stocks stored in the soil were measured after the 10-year period, and emissions of the greenhouse gases methane, carbon dioxide, and nitrous oxide were monitored for a complete year. These three gases are thought to contribute to global change, and they are the most important ones exchanged between agricultural systems and the atmosphere. "The biomass of microbes in the soil plays an important role in determining net greenhouse gas emissions from soil because microbes are responsible for processes in soil that regulate the rates at which these gases are exchanged with air. Different microbes are involved in different processes and different gases. Monitoring multiple greenhouse gas emissions is essential to assess ability of cropland management to mitigate global warming. The complete picture of greenhouse gas emissions is critical in our development of soil carbon sequestration technologies in agriculture," says De-Polli. "The no-tillage soil-management system showed that it can help this mitigation process. It showed potential to remove carbon from the atmosphere, because crop plants remove carbon dixode from the atmosphere and convert it to plant tissues, some of which remain in the field as stored carbon after the crop is harvested," continues De-Polli. "But we found that on warmer days, there was a greater potential for nitrous oxide emission. So nitrogen application must be carefully managed in the no-tillage system." "The degree to which no-tillage management has been implemented by Brazilian farmers over the last decade has been remarkable," says McCarty. "It has truly been a technology revolution down there, and U.S. agriculture has much to learn from the Brazilian example. This shows that the information exchange fostered by LABEX benefits agriculture in both countries." Soil scientist Gregory McCarty, chemist James Reeves, and LABEX coordinator Pedro Arraes discuss use of mid-infrared spectral data for soil analyses. "Helvecio is a top-flight senior scientist, who has not only conducted his own research, but was the catalyst for other scientific contacts between labs in USDA-ARS and Embrapa in Brazil," says McCarty. "He has been actively engaged in the research efforts of several other ARS scientists concerning water quality, manure management, and soil carbon measurement techniques." One such connection involves testing Brazilian soil samples for carbon content with new mid- and near-infrared technology under development by James Reeves, an ARS chemist in the Animal Manure and Byproducts Laboratory in Beltsville. The data from the soil-sample testing created a database of infrared spectra. 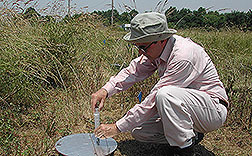 Reeves spent the month of June in 2004 in Brazil using that database to develop rapid methods for measuring soil properties of Brazilian soils. He worked with Beata Madari and Pedro Machado at the Embrapa Soil Center. "Our focus was to find out whether near-infrared or mid-infrared technologies could be used on a large group of soil samples," says Reeves. These techniques use light in varying wavelengths to determine the composition of a sample. "More than 1,200 soil samples were tested from Brazil's national collection. The extension of the infrared work from the temperate soils of the United States to the tropical soils of Brazil has led to better understanding of factors influencing the quality of information extracted from spectral data. This will improve our ability to accurately measure carbon storage and sequestration in soil." "ARS laboratories formed a national network of soil carbon research projects called GRACENET" (Greenhouse-Gas Reduction through Agricultural Carbon Enhancement Network), says ARS national program leader Michael Jawson. "The goal is to coordinate research projects with a common theme and compare data. Multiple ARS locations will be part of the network to determine the effects of management practices on carbon sequestration, trace gas emissions, and environmental quality. The locations will represent a variety of range, pasture, and crop systems." Ultimately, a national system will be developed to store the data and allow scientists to share it. "Embrapa has developed a very similar system called the AGROGASES network to measure and evaluate the carbon stock and greenhouse gas emissions from different land-use systems in Brazil," says De-Polli. AGROGASES is coordinated by Magda Aparecida de Lima from Embrapa Environment. "The goals and approaches of GRACENET and AGROGASES are similar, with the potential for collaboration. The next step to bring this to fruition is to develop a common database for free information exchange and to standardize the protocols so we can make meaningful comparisons," says McCarty. "My focus has been the interrelatedness of gas emissions to temperature, carbon sequestration, and other environmental factors," says De-Polli. "But my time with ARS has helped foster a cooperative spirit of research projects and has spawned more collaborations for the future. "—By Sharon Durham, Agricultural Research Service Information Staff. This research is part of Global Change, an ARS National Program (#204) described on the World Wide Web at www.nps.ars.usda.gov. Gregory McCarty is in the USDA-ARS Environmental Quality Laboratory, 10300 Baltimore Ave., Beltsville, MD 20705-2350; phone (301) 504-7401, fax (301) 504-5048. Helvecio De-Polli is with Embrapa Agrobiologia, Rio De Janeiro, Brazil. 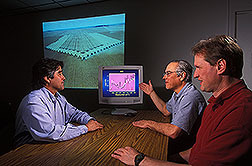 "United States—Brazil Collaboration Heats Up" was published in the April 2005 issue of Agricultural Research magazine.